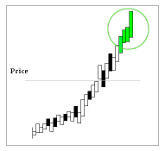 There is a pattern of bullish momentum in Oracle Corporation (NYSE:ORCL) stock just 3 trading days before earnings, that has not only shown exceptional results over the last 5-years, but also during the Great Recession. According to our data provider, Wall Street Horizon, Oracle next has earnings due out on 2018-09-17. Three trading days before then would be 2018-09-12, near the end of the day. We will examine the outcome of going long a two-week call option in Oracle Corporation just three trading days before earnings and selling the call the day of earnings but before the actual news. Since Oracle reports earnings after the market closes, the back-test does not hold the risk of the earnings event. ➡ The average percent return per trade was 40.2%. ➡ The average percent return per winning trade was 45.7%. ➡ The average percent return per losing trade was -9.3%. We have shown that this pre-earnings momentum pattern in the Nasdaq 100 and Dow 30 stocks has persisted and is statistically significant not just during this bull market, but also during the Great Recession. There's a lot less luck to successful option trading than many people realize. We mean that literally. Become the expert in the room -- or don't. You can tap the link below to become your own option expert.